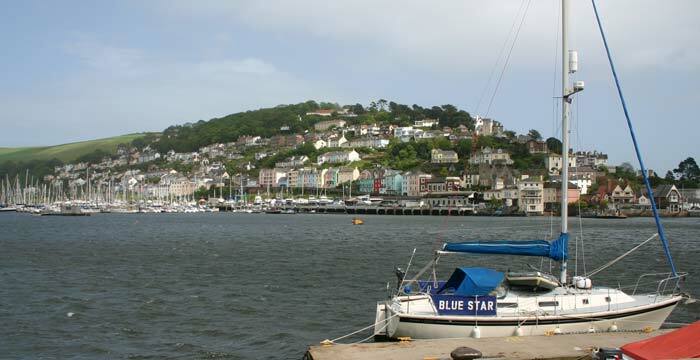 Dartmouth in South Devon is a small port town at the mouth of the River Dart, it has a long history as a port having twice been the sailing point for crusades in 1147 and 1190, the Mayflower put in here before sailing to America (she then put in to Plymouth before crossing the Atlantic) and is still home to the Britannia Royal Naval College. The population is about 5,500. The newest photos are full size here at the top of the page, thumbnails of older photos are below. 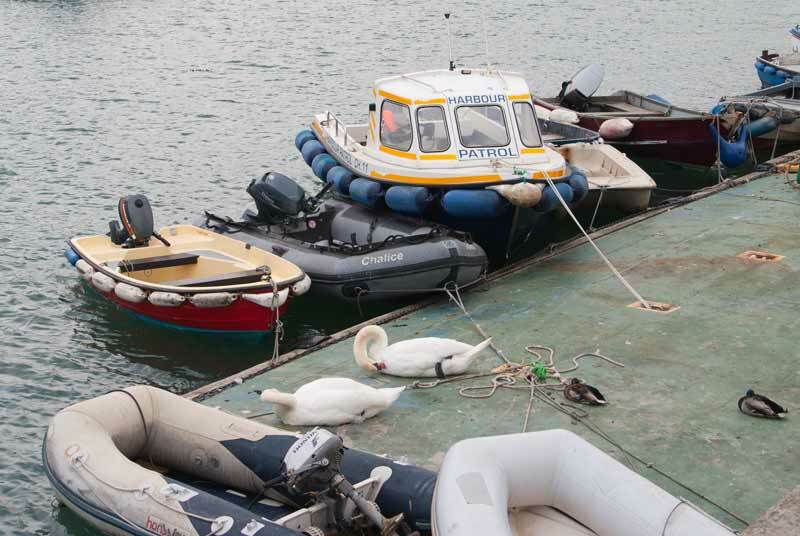 Are these swans and ducks in charge of the Harbour Patrol? A Brixham sailing trawler moored in the middle of the river. 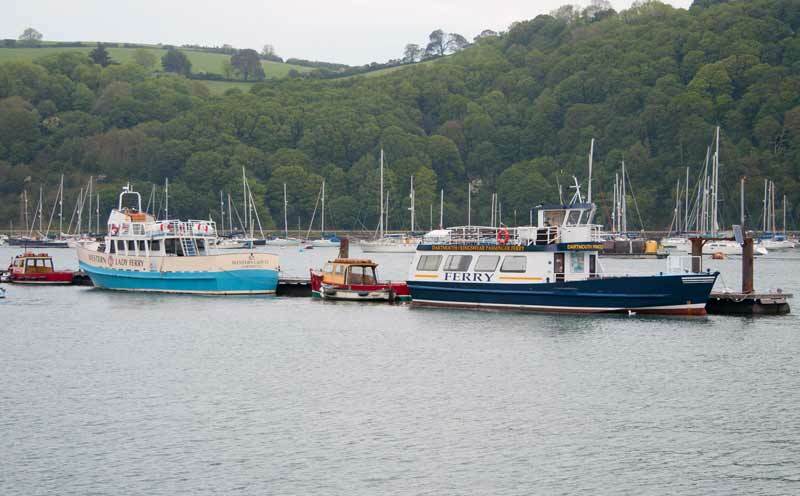 One of the Dartmouth - Kingswear ferries is moored near one of the Western Lady ferries which operate between Torquay and Brixham but belong to the same company. 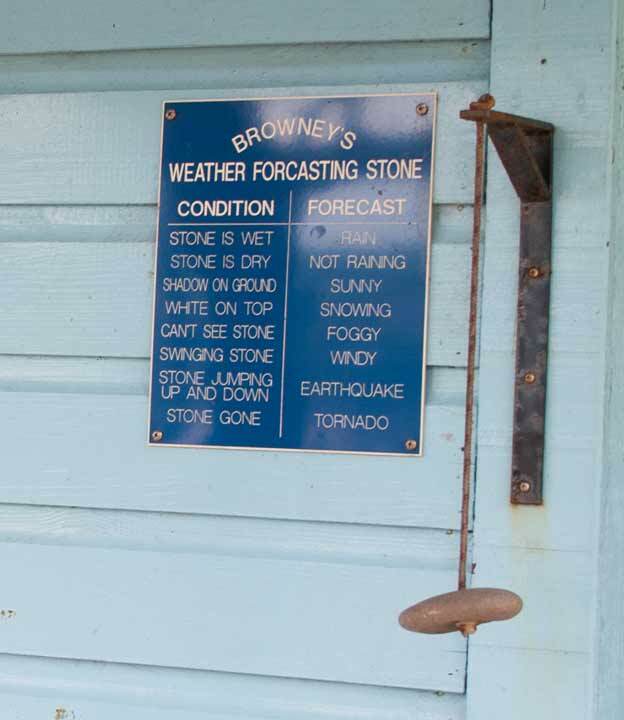 A surprisingly accurate means of forecasting the weather outside the café in the gardens. 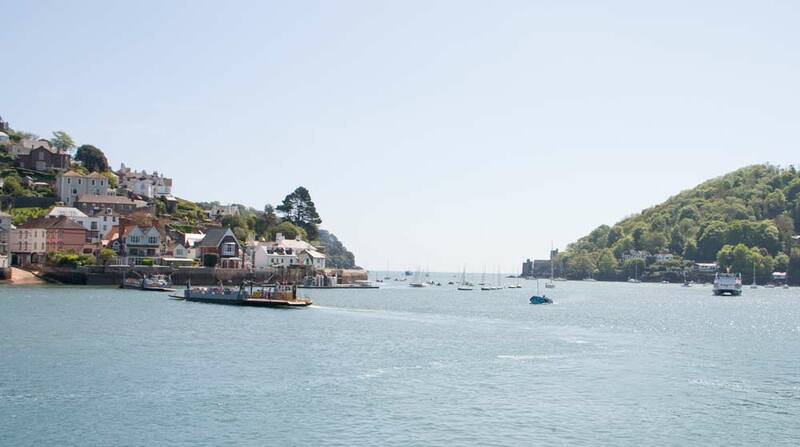 A steam train from Paignton approaching Kingswear seen across the river from Dartmouth. 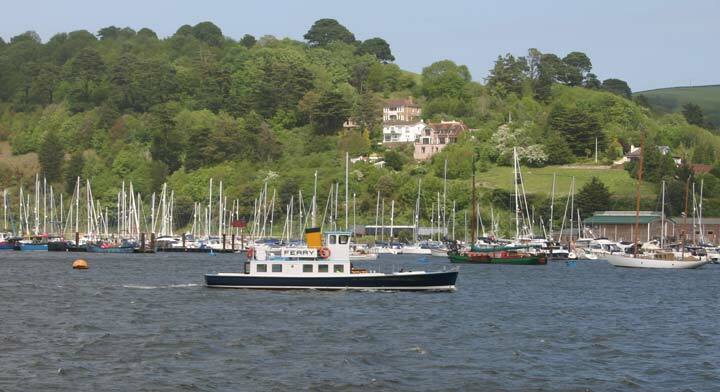 The paddle steamer Kingswear Castle passing Higher Ferry returning from a trip up the river. 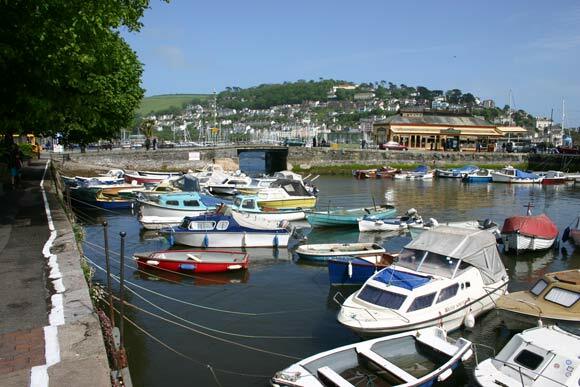 In the centre of Dartmouth is the boat float seen in these two views. 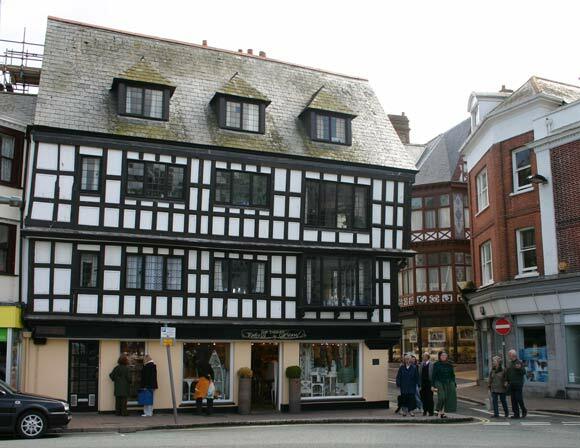 On one side is bordered by the road between it and the river, on another by a small park and on the others by shops including a few old timbered buildings. Turning round from where the above photos were taken is the famous Butterwalk, an old building, the upper floors project out over the pavement gaining a considerable amount of space in the process - and they protect shoppers below from the rain! 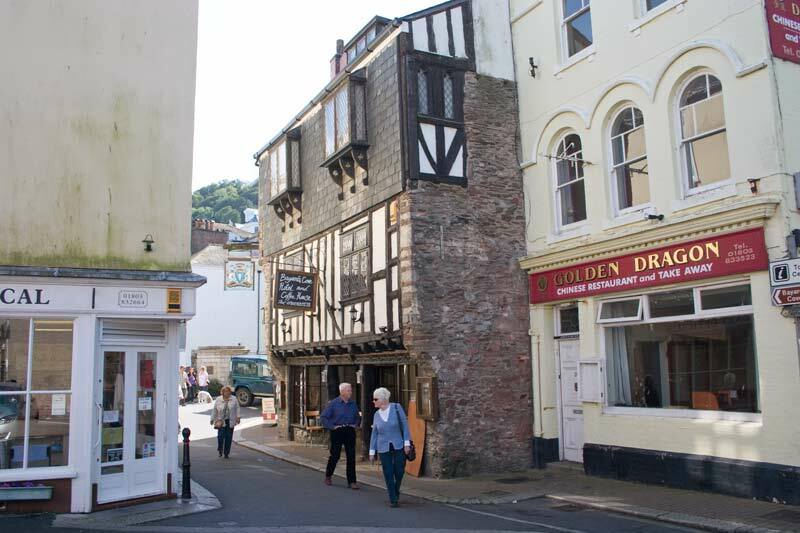 On the other inland corner of the boat float are more old timber framed buildings, Dartmouth is a delightful little town full of character - putting this page together I've realised how many more photos I should have taken! 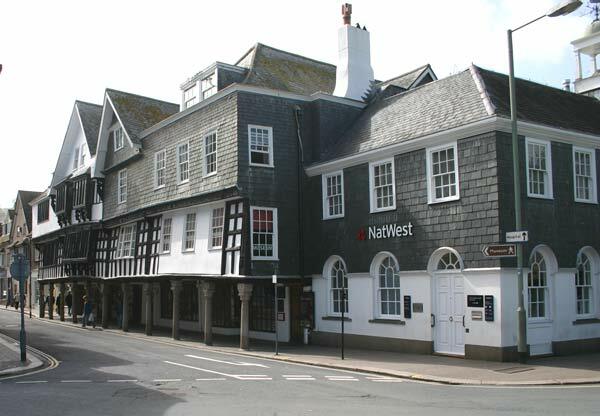 Every corner has a treat in store in the centre of Dartmouth. 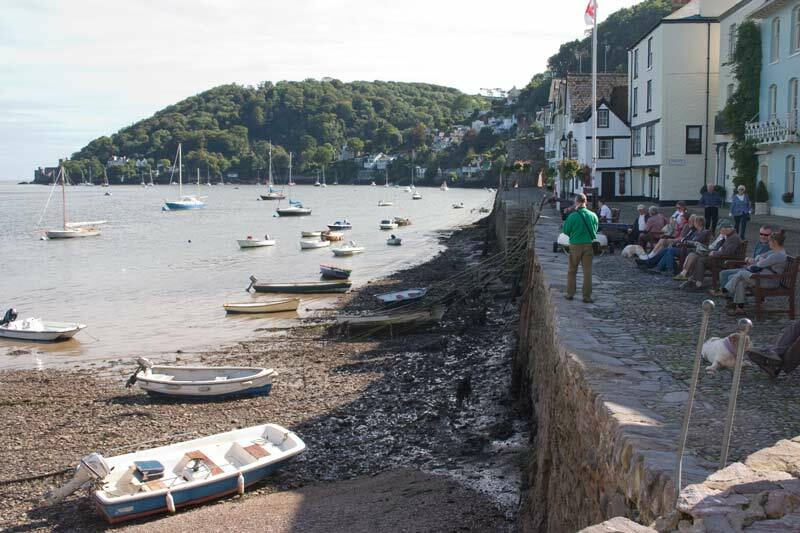 Towards the sea is Dartmouth Castle, close to it is this little cove reached by a steep stairway. 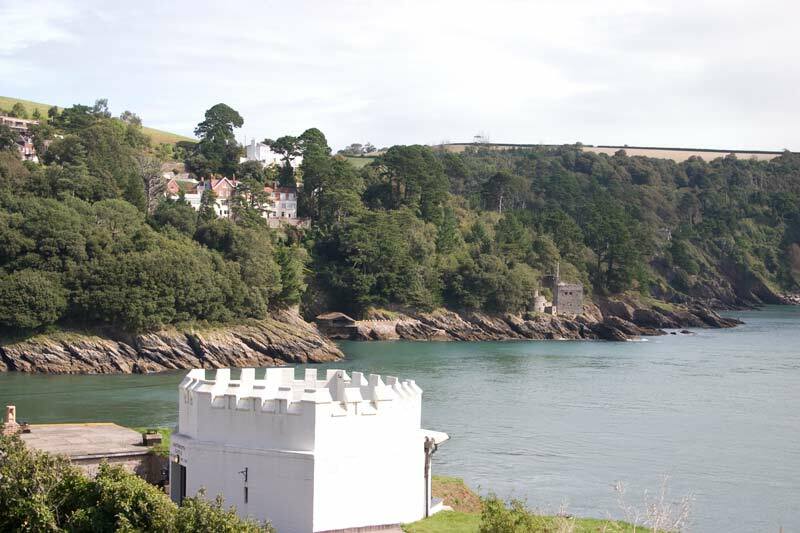 Looking over part of Dartmouth Castle across the mouth of the Dart to Kingswear Castle. 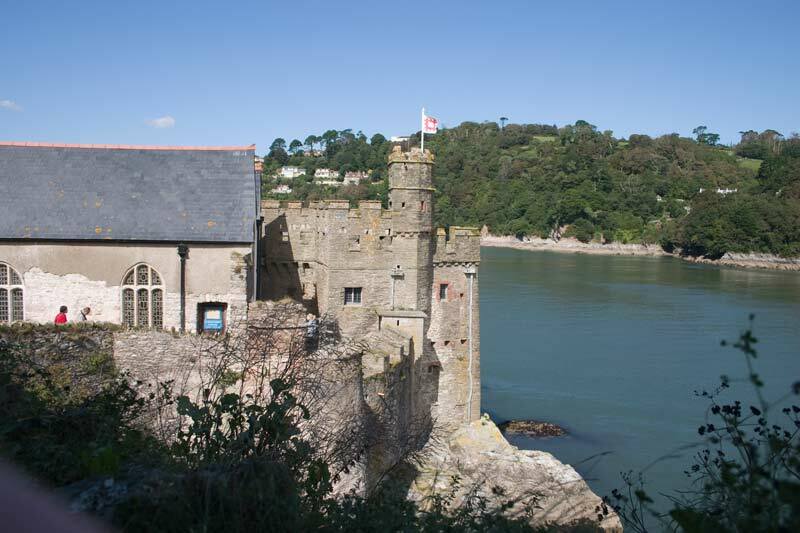 The Castle proper nestles up against St. Petrox church, the two castles worked together to defend the port against invaders using a chain between them as well as cannons. 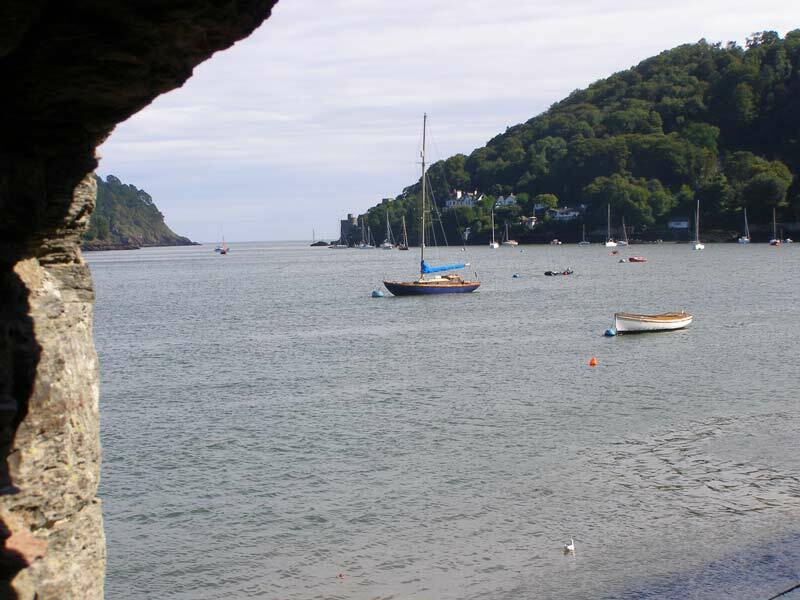 The Lower Ferry to Kingswear glimpsed through a gun port in the fort by Bayards Cove. 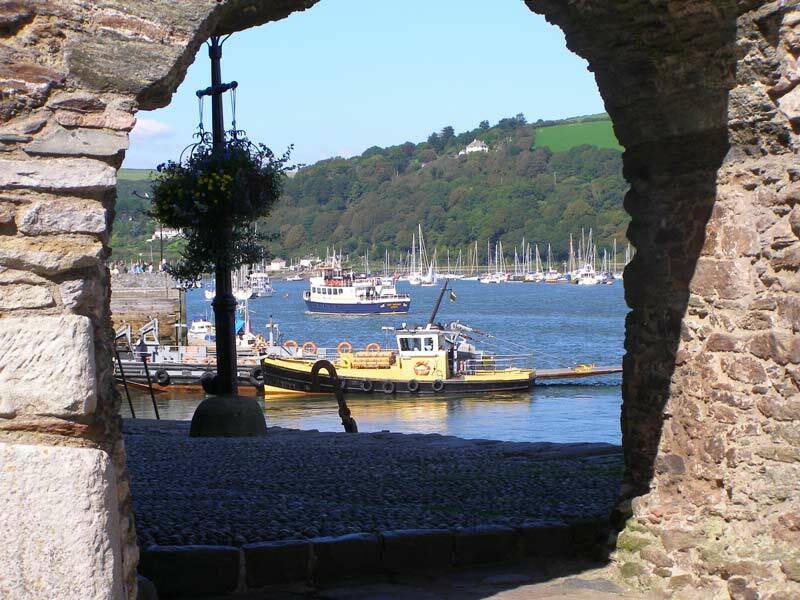 Looking seaward through another gun port toward Dartmouth Castle. Bayards Cove, scenes for the "Onedin Line" were filmed here, the Mayflower sailed from here to America - before putting into Plymouth for repairs. 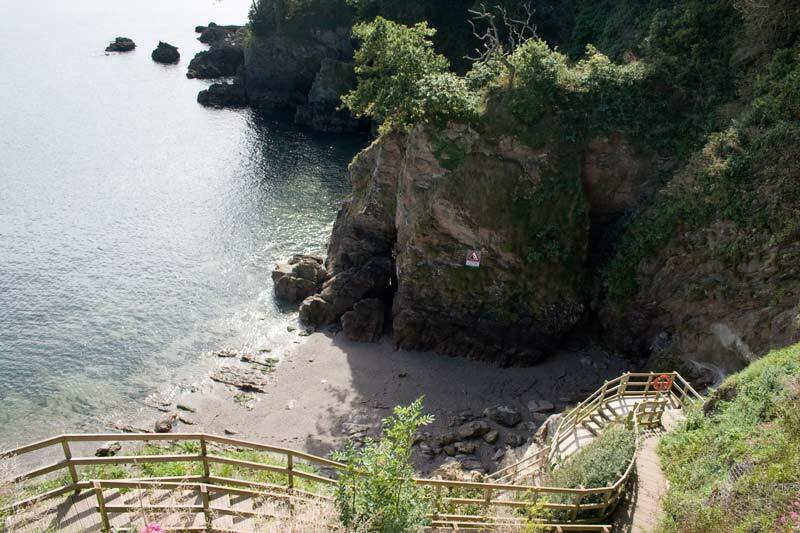 Historic, unspoilt and well worth a visit. 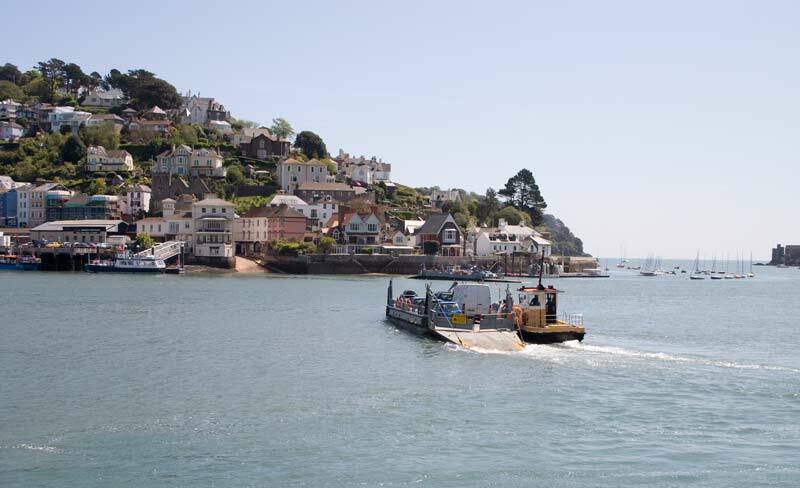 Dartmouth has two car ferry services across the river to Kingswear, this is the Lower Ferry with Dartmouth Castle and the sea in the background. 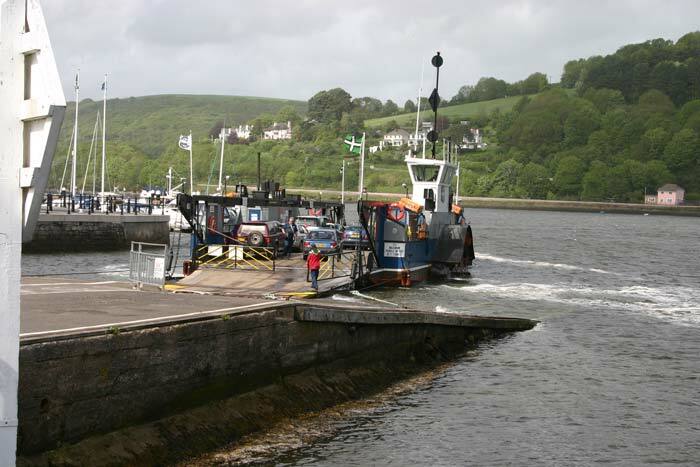 Lower Ferry carries out an interesting manoeuvre each crossing as the cars are on a barge hauled by a tug. 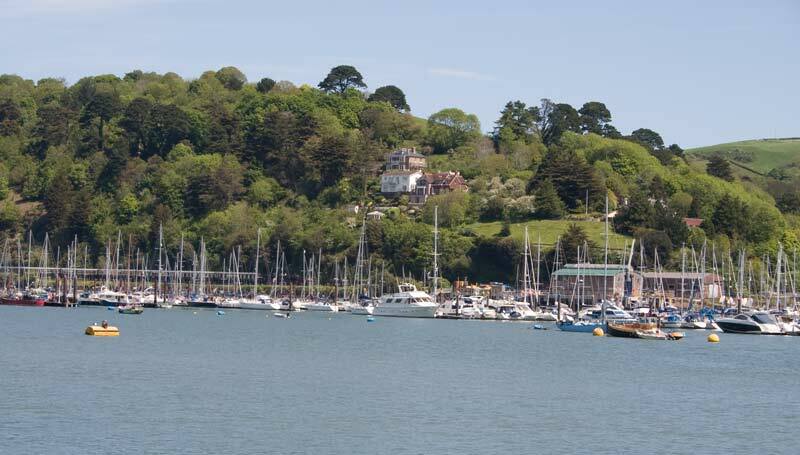 Looking towards the sea and Dartmouth Castle from near Lower Ferry. 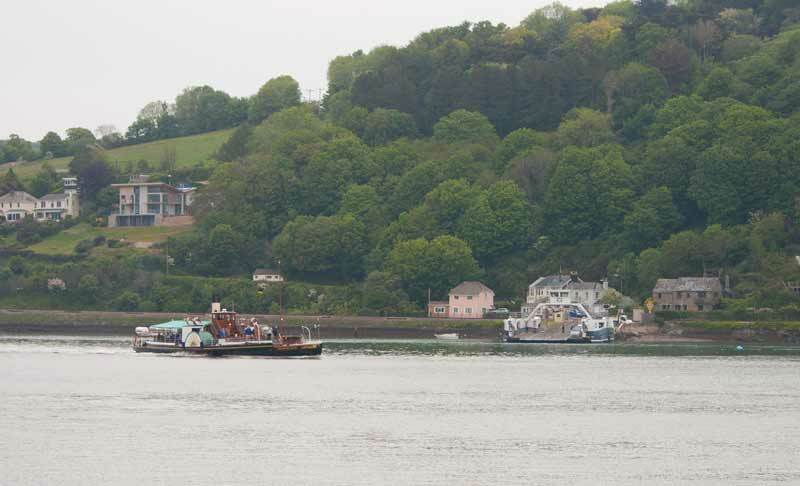 Another view from the same vantage point, the two vessels on the Lower Ferry pass each other as the little ferry out to the Castle heads in and beyond that the Dart Explorer returns from a trip out to sea. 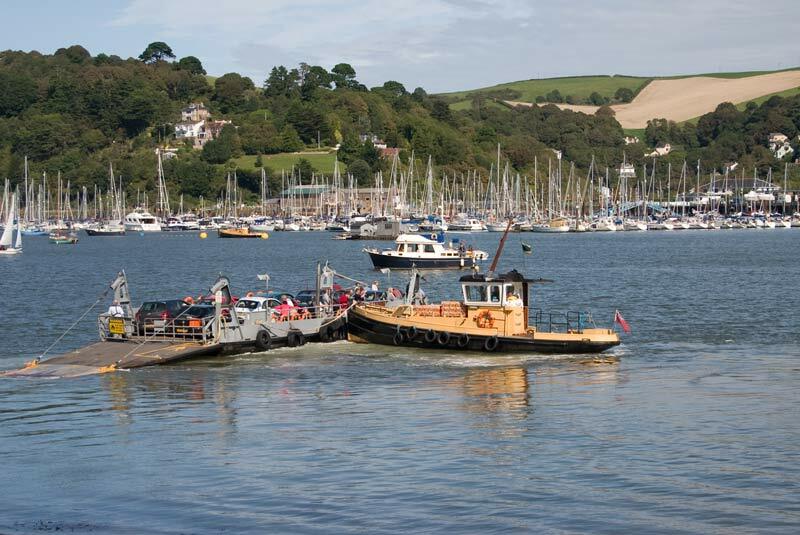 Another view of the Lower Ferry pair passing on their way to and from Kingswear. 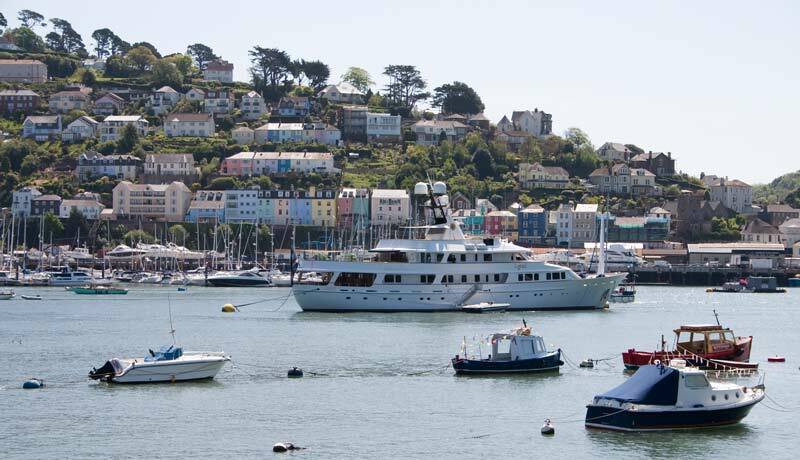 The Fairmile, a wartime Rescue Launch, now doing cruises with the Greenway Ferry entering Dartmouth Harbour from Torbay. 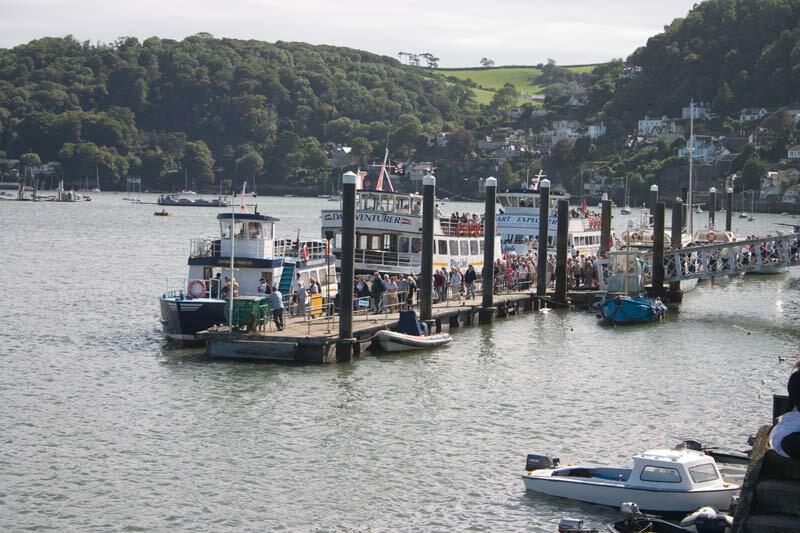 For foot passengers there is also this passenger ferry across to Kingswear, handy for the steam railway to Paignton and for buses. 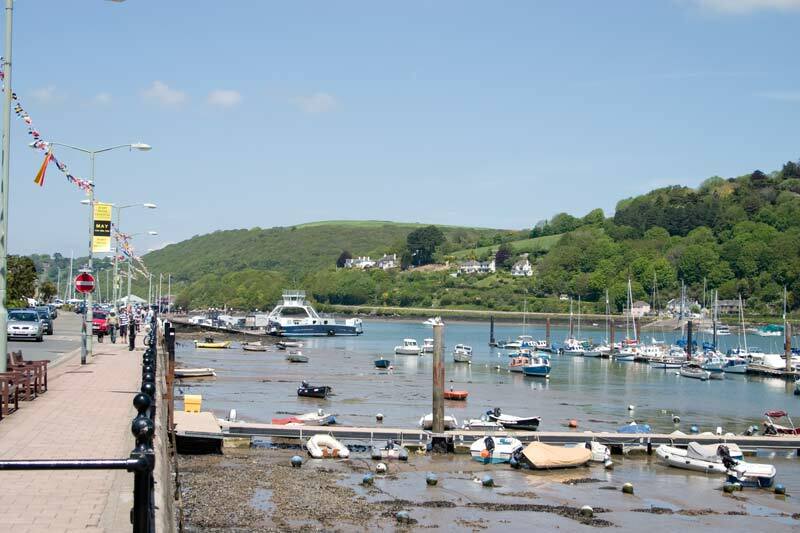 It is seen here with the masts of yachts at the marina and the wooded hills behind it. 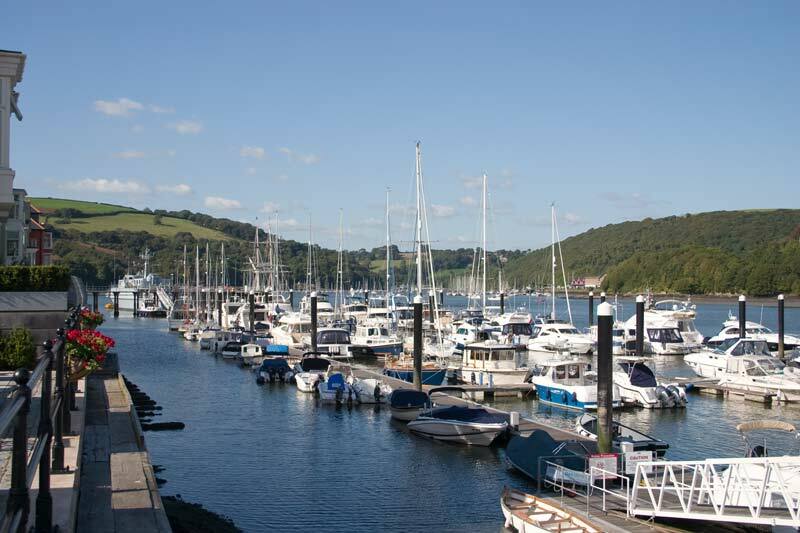 There are so many masts in this view they almost completely hide the steam train arriving at Kingswear after its trip from Paignton. 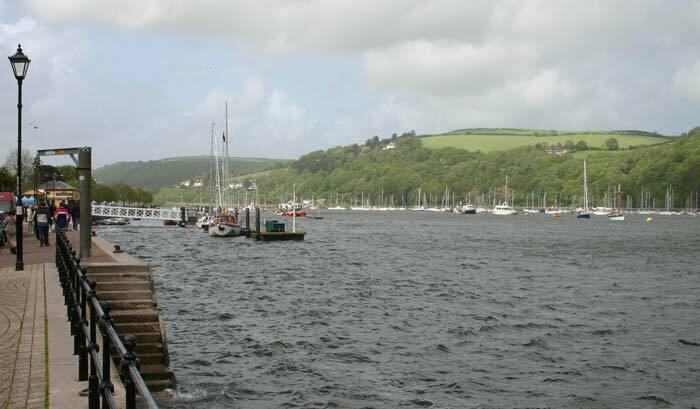 A variety of craft on the ferry pontoon, the Kingswear ferry along with vessels that do trips up the River Dart or out to sea. Looking up river the ferry pontoon was unusually empty, the view was however as always beautiful. 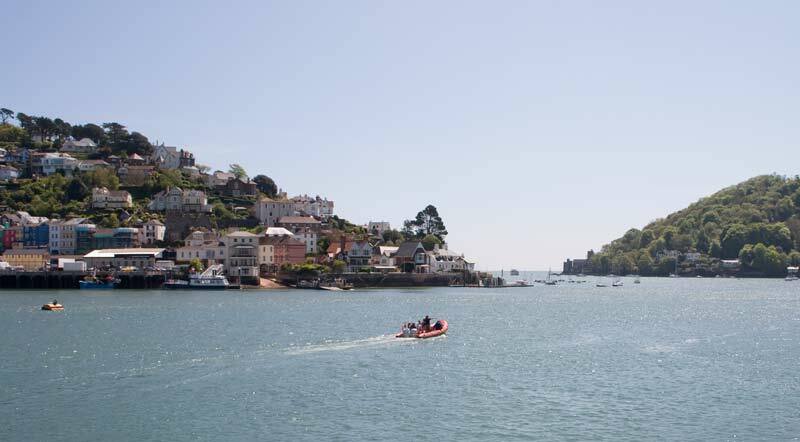 Looking across the harbour to Kingswear with its houses rising up the hillside. 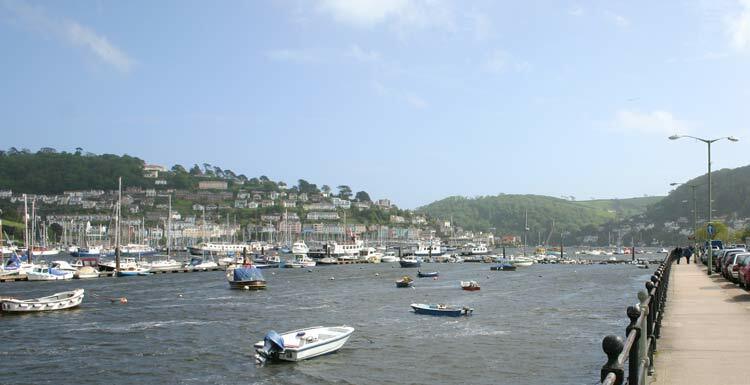 The whole of Dartmouth Harbour, and indeed the Dart estuary, is full of beautiful views that mere photos can't do justice to. Looking up the harbour with the passenger ferry pontoon in the foreground and across the river some more of those beautiful wooded slopes rising from the river bank. 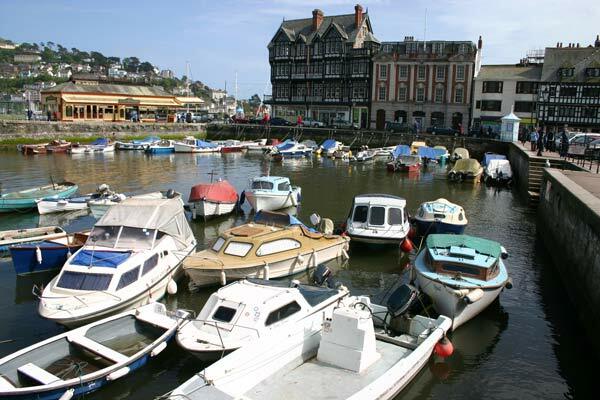 Having walked further up along the harbour side, a view back over the variety of boats moored here. 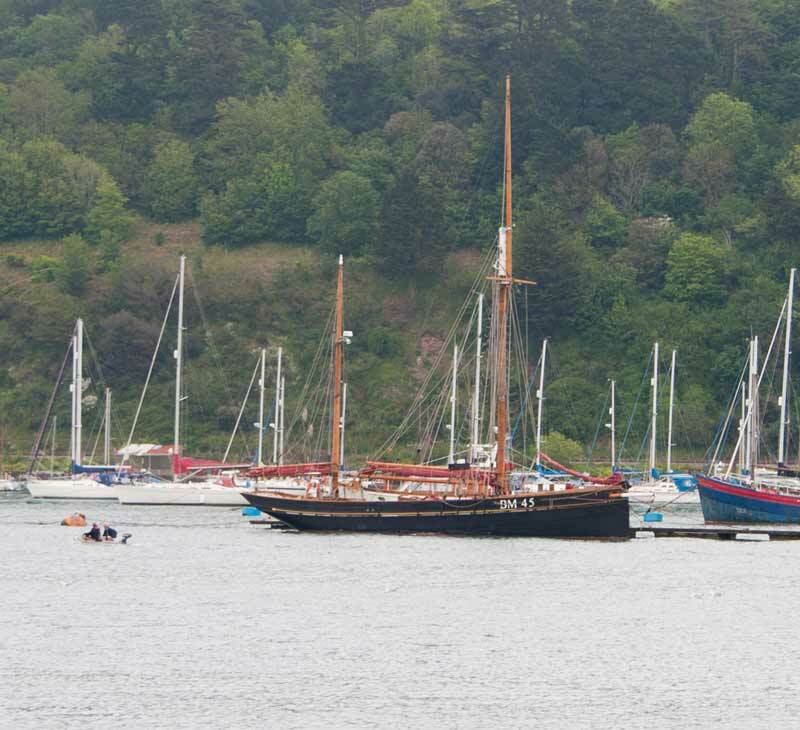 Two views of Kingswear with the charter yacht Legend moored in the river. At the opposite end of the harbour to the Lower Ferry is... Higher Ferry! A chain ferry, this one used paddle wheels to propel it across the river. This is the main way across for cars but the queues can get lengthy at busy times. 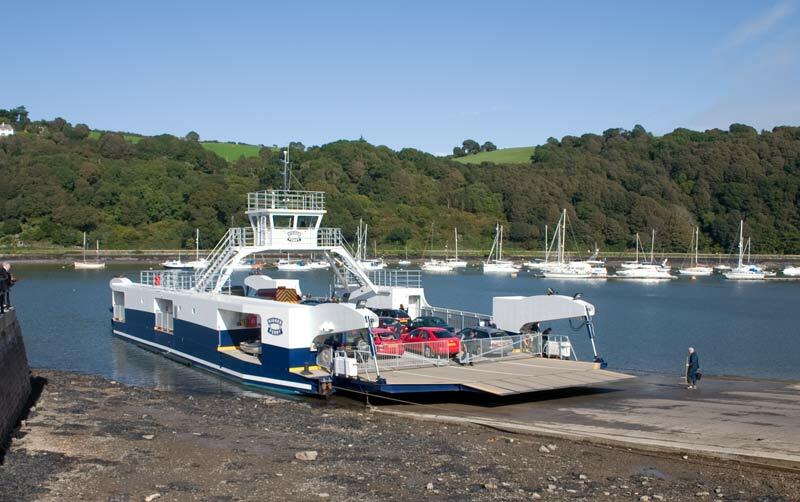 A more recent view of Higher Ferry with a new vessel in service. Another view of Higher Ferry with the wooded slopes of the valley sides in the background. 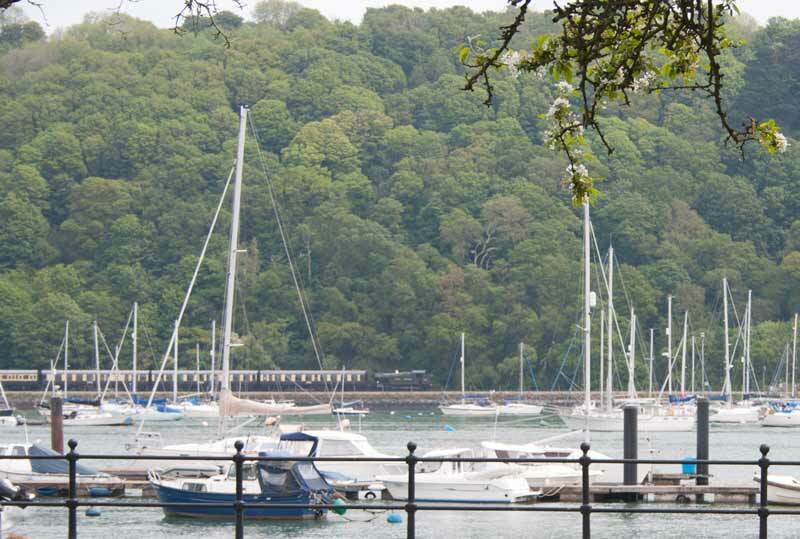 Beyond Higher Ferry is a thriving Marina, beyond that is a Royal Navy ship attached to the Britannia Royal Naval College. 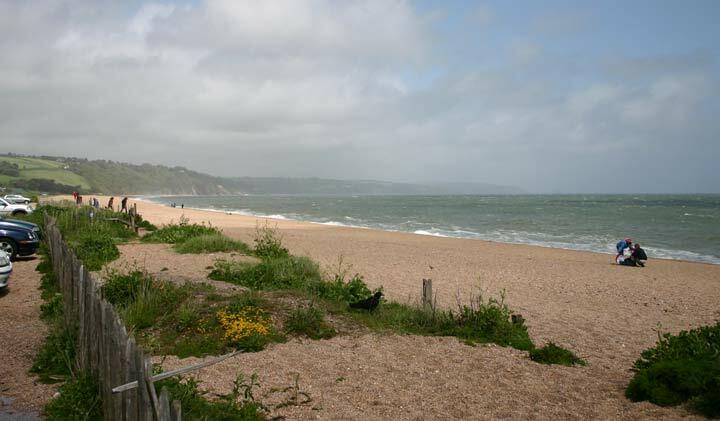 Near Dartmouth is Slapton with its long shingle beach seen here looking south towards the village of Torcross. 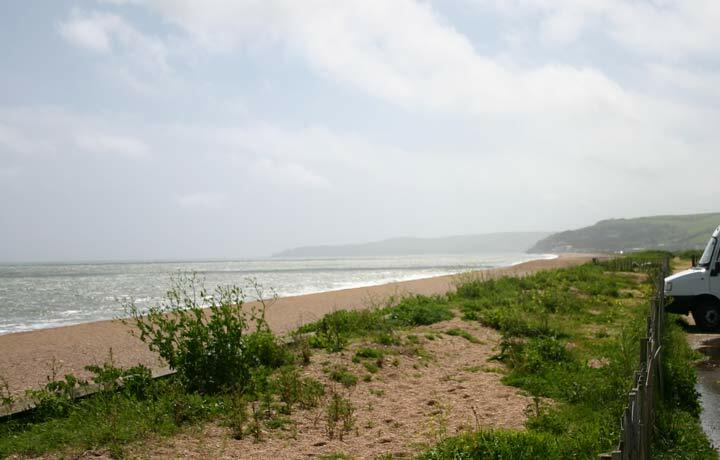 Looking north towards Strete, Stoke Fleming (where my father was born) and the cliffs protecting Dartmouth. 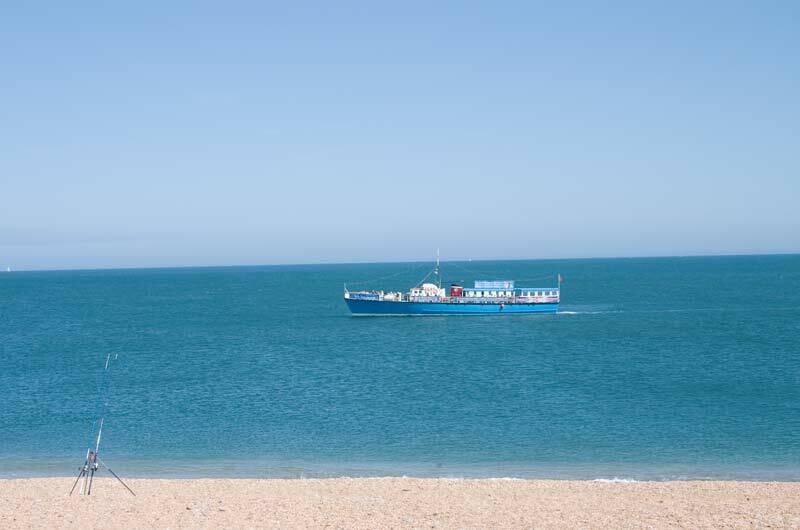 The Fairmile is seen again cruising along Slapton Sands near the D Day memorial. 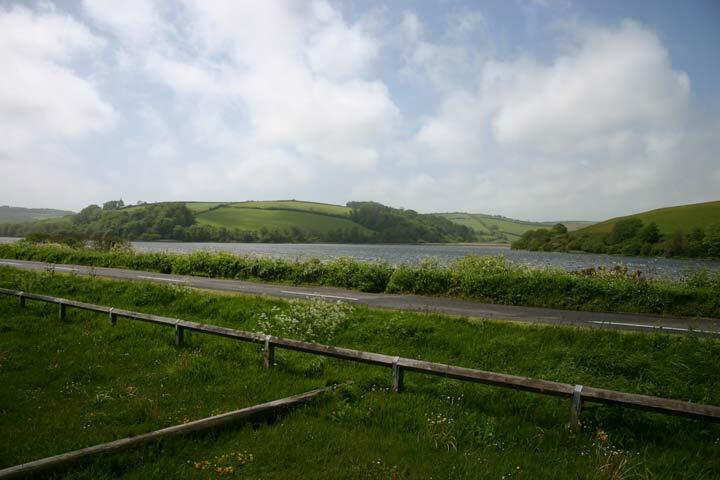 Behind the shingle ridge of the beach is a fresh water lake, Slapton Ley, another of natures beautiful gifts to this part of Devon. 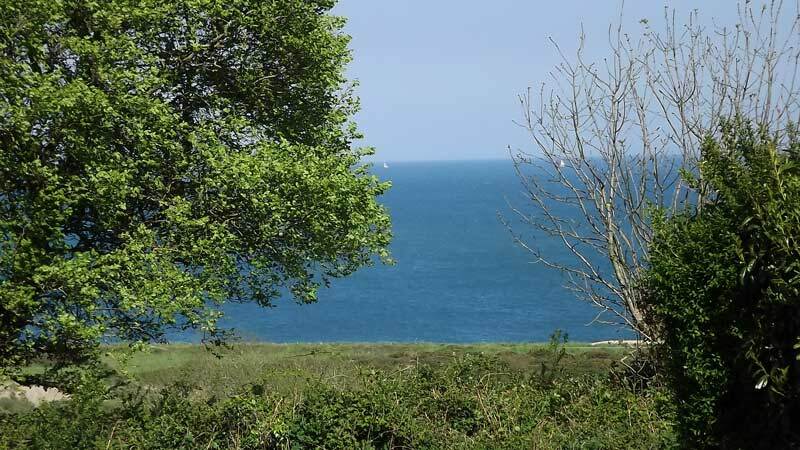 The view from the Camping & Caravanning Club site at Slapton looking out over Start Bay to the entrance to Dartmouth with the Mew Stone outside it. 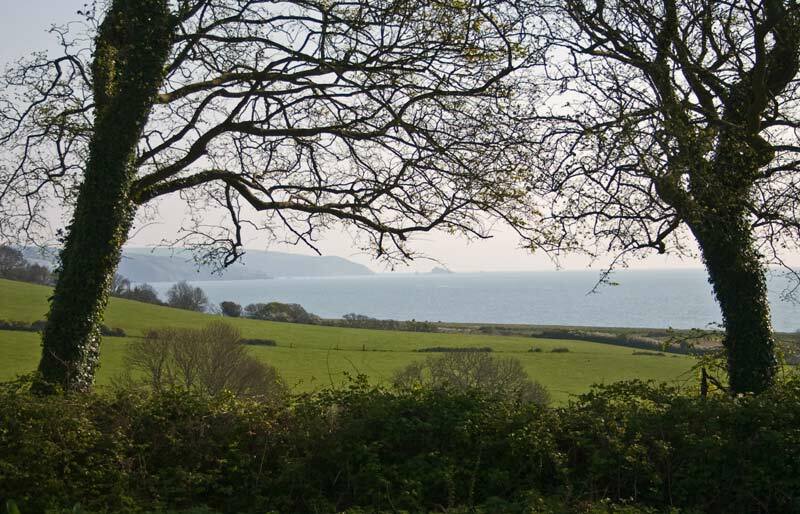 Another view from the CCC site to the blue sea of Start Bay.